On Tuesday, the United States, Afghanistan, and the Taliban agreed to participate in peace talks in Doha, Qatar. But by Wednesday the Afghan government had pulled out of the talks and the American government remained confused and stung by the broken promise of discussion. The already rocky-road to peace represents what is to come, and how peace in Afghanistan may not be achievable. Hamid Karzai and his administration in Kabul took over security responsibilities from the United States-led coalition on Tuesday afternoon. That same day, the Taliban opened an office in Doha. Later that afternoon, four coalition troops were killed in eastern Afghanistan, which the Taliban claimed responsibility for later—a bad start to a week supposed to bring peace. The Taliban opened its office under the name “Islamic Emirate of Afghanistan,” which was the name it once ruled Afghanistan under. Mr. Karzai claimed that this violated the terms under which the Afghan government agreed to the talks. After many ignored calls by the U.S. Secretary of State John Kerry, Mr. Karzai called the U.S. duplicitous and said Afghanistan would not resume negotiations until the U.S. stepped back from the talks. The Taliban insurgency has no intention of laying down arms, even as they pursue the peace talks, according to Sohail Shaheen, a Taliban representative. Shaheen went on to say that “the military option is continuing.” This raises the question of the seriousness of the Taliban’s commitment to peace. The United States-led coalition went into Afghanistan to wrest power from the Taliban, an Islamic fundamentalist regime that hosted al Qaeda leadership. Since the removal of the Taliban from power and the subsequent appointment of Hamid Karzai as president, a dual-government seems to have been established. Some Afghan citizens pay loyalty to the newly appointed president Karzai, while others still fight for Taliban rule. So, could the opening of an office in Qatar be a stepping stone for a new Taliban take over in Afghanistan? The possibility is not far-fetched. The call for peace negotiations by the Taliban seems more like a front for the insurgent group to gain power and legitimacy. When the U.S. leaves Afghanistan in 2014, the country will be ripe for another Taliban rise-up. The Taliban has no incentives to negotiate seriously if they believe they can retake parts of Afghanistan after the U.S. leaves in 2014. With failed peace-talks and sketchy Taliban plans, there may be other options that the U.S. should pursue. The U.S. needs to provide the Afghan army and police all the support they need. While the United States government is antsy to get out of Afghanistan after this long and drawn-out war, they need to stay and give the Afghan government all the help it can get. If the U.S. leaves without establishing a fully competent and able Afghan army, the Taliban will be able to take over much more easily. The United States should focus more attention on those areas that are still harboring support for the Taliban. By working with the Afghan government to create a more decentralized system of coordination, changes could occur to foster support for Karzai. Focusing on the specific needs of certain regions, the Afghan government could booster support. For instance, if the Afghan government worked with the United States to bring better healthcare to the Kandahar region, which is known to have overstretched health care services, they could foster support. This decentralization effort will foster support for Karzai and his government. These are just two options that the United States should pursue to create a condition that will foster peace between Afghanistan and the Taliban. These options would decrease the Taliban’s power and influence, creating more of an incentive for the Taliban to turn to peace talks. The United States, Afghanistan and the Taliban are not ready to turn to peace yet. By forcing peace talks, the countries will become more angered while the conditions stay the same. 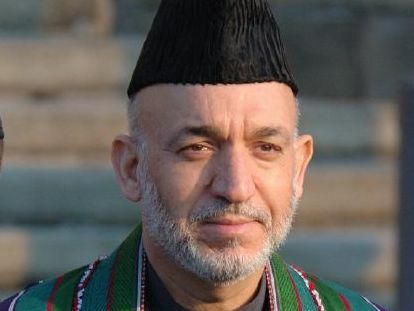 Hamid Karzai must remain in power when the United States leaves Afghanistan in 2014, and will not do so if the Taliban continues to hold power in certain regions. Tags: Afghan War, Afghanistan, al Qaeda, Foreign Policy, Hamid Karzai, John Kerry, Kabul, Peace, Qatar, United States. Bookmark the permalink.